Ralph Hardesty (@ralphiehardesty) let us into his home to discuss his beginnings as a comic. 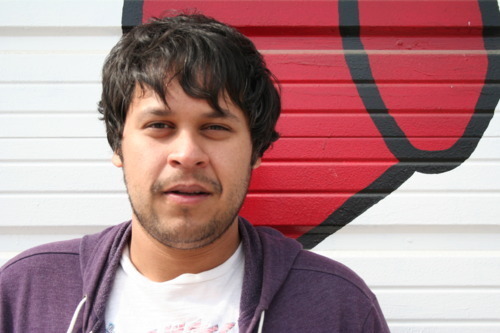 You can catch Ralph during the standup showcase this Wednesday at 10:30pm at the Velveeta Room. Brendan K. O’Grady (@bkogrady) met us to discuss his budding comedy career and where he finds the funny. You can catch BKO during the standup comedy showcase at the Velveeta Room, Wednesday August 29th at 10:30pm. This video speaks for itself, but Chris Tellez is a pretty funny, dude. When he’s not whispering sweet nothings into our microphone, he’s bringing his unique observations to the Austin comedy scene. Enjoy! Get used to seeing more of these throughout the next week. On this second episode of Comedic ‘Views, we talk with Maggie Maye about what brought her to Austin and what attracts her to being a comic. Comedic ‘Views (short for interviews) is something Jen and I have wanted to do for a while. When the Out of Bounds Comedy Festival was looking for bloggers, we offered to do some video production for them. The result of which will be at least 13 interview videos / episodes for this mini-web series. We’ll be posting the short docs over the next two weeks leading up to the fest. The first just went live and features Jake Flores, an Austin based comedian who never fails to surprise us with his funny and thoughtful comedy. I’ve had the priviledge in the last month of working with MC Thad Newman, aka comedian Ryan Cownie. Below is the product of ours, and several others, efforts to make a hip hop music video of a song based around Newman’s love and skill for Magic The Gathering. I first saw Cownie perform at the 2011 Funniest Person In Austin contest and was floored by his unique stage presence. To work with him closely on this project, and hopefully on a project in the future, has been an honor. He’ll be at Cap City tonight as well as the Velveeta Room tomorrow and I encourage you to check him out. In the meantime, I present for your consideration Graveborn. We collaborated with our friends on this trailer for the Filmmaking Frenzy contest. Check it out! Shot taken from the set! Aaron Spivey Sorrells tearing it up during FPIA! Brendan K. O’Grady jamming through his FPIA set!